and Namib desert golden mole [Eremitalpa granti], respectively) is also substantially slower than walking or running above ground (about 1,476 ft/h [450 m/h]). It would apparently be energetically impossible for these mammals to obtain enough food by foraging only underground. Indeed, in one study of free-living Namib desert golden moles, the mean daily track length was 0.87 mi (1.4 km), but only 52.5 ft (16 m) of it was below the surface. Subterranean mammals can move backwards with the same ease as forwards. The skin is usually somewhat slack, and the fur tends to be short and upright, brushing in either direction. These all may be burrowing adaptations to match frictional resistance, to facilitate moving and turning in tunnels. 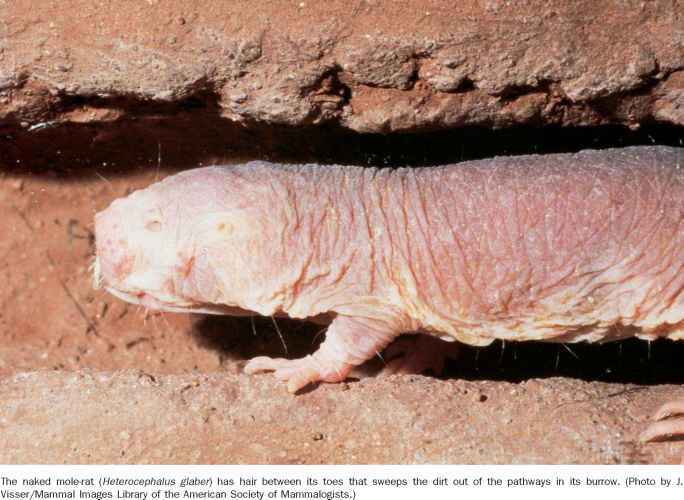 The extremes such as the total alopecia (hairlessness) of the naked mole-rat or the long hairs and thick pelage of the silvery molerat (Heliophobius argenteocinereus) are exceptions to the rule and should not be considered burrowing adaptations per se. Reduction or even absence of auricles (pinnae) may be beneficial for digging and moving in tunnels because of the reduced friction. The popular assumption that auricles are reduced or missing because, otherwise, they would have to act as shovels collecting all the dirt cannot withstand critical comparative analysis. Many burrowing rodents have rather prominent auricles and are apparently not handicapped. Probably more im portant than whether auricles are an advantage or disadvantage for burrowing is whether they are required for sound localization. If not needed for hearing, only then would they be reduced. The tail tends to be shortened in subterranean and fossorial mammals, yet there is no clear explanation as to the adaptive value of this feature. 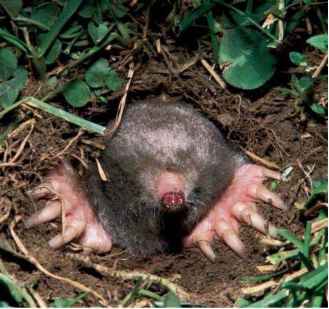 For instance, African mole-rats of two related genera, Heterocephalus and Cryptomys, differ in this trait markedly. Similarly, fossorial-subterranean octodon-tids have medium-sized tails, whereas related surface dwelling cavies have reduced tails. Vibrissae in subterranean mammals are also shorter and less protruding than in many surface dwellers. In sand-swimming golden and marsupial moles, they are inconspicuous, sometimes even missing.